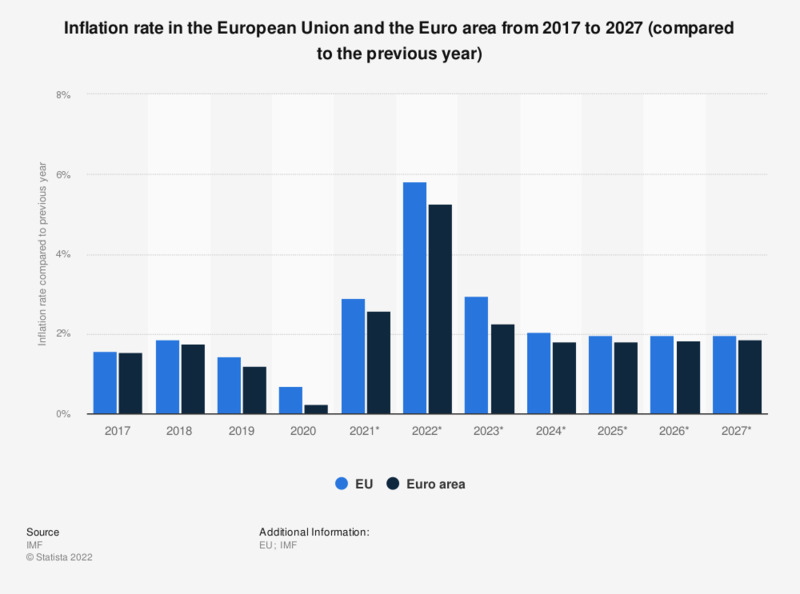 The statistic shows the inflation rate in the European Union and the Euro area from 2012 to 2017, with projections up until 2022. The term inflation, also known as currency devaluation (drop in the value of money), is characterized by a steady rise in prices for finished products (consumer goods, capital goods). The consumer price index tracks price trends of private consumption expenditure, and shows an increase in the index's current level of inflation. In 2017, the inflation rate in the EU was about 1.74 percent compared to the previous year. The ongoing Eurozone crisis, which initially emerged in 2009, has dramatically affected most countries in the European Union. The crisis primarily prevented many countries from refinancing their debt without help from a third party and slowed economic growth throughout the entire EU. As a result, general gross debt escalated annually in the euro area and more prominently in the EU. The collective sum of debt is most likely going to continue, given the current global economic situation as well as Europe’s recovering, however struggling economy. Struggles are primarily evident in the EU’s budget balance, which saw itself in the negative every year over the same timeframe as the eurozone crisis, although the balances improved on a yearly basis. Despite economical struggles, the EU still grew in population almost every year over the past decade, primarily due to a high standard of living and job opportunities, compared to many of its surrounding neighbors.